Passed away peacefully surrounded by his loving family and friends. Treasured husband of Andrea. Devoted father of Jorjia and Maxx. The Funeral Cortege for Mr Andrew Bond "Bondy" of Two Rocks will arrive at PINNAROO Valley Memorial Park, West Chapel for a Cremation Service on FRIDAY (05.04.2019) commencing at 1.00pm. 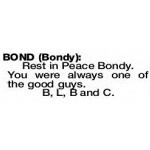 Rest in Peace Bondy. You were always one of the good guys. B, L, B and C.